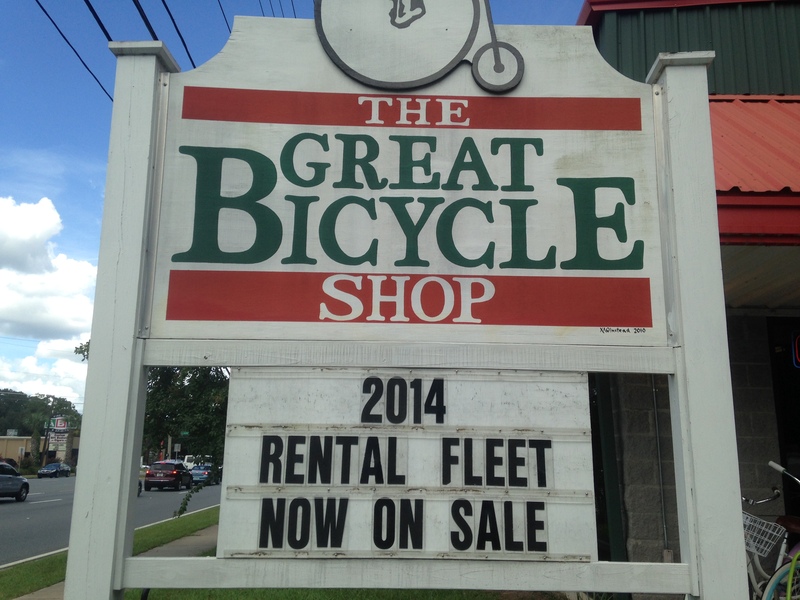 The Great Bicycle Blog | Serving Tallahassee area cyclists since 1971. 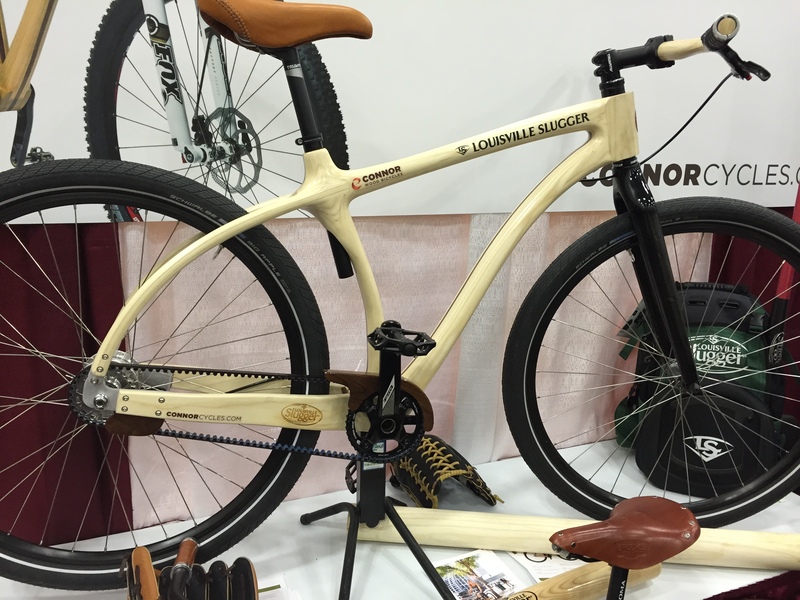 This past weekend the North American Handmade Bicycle Shows (NAHBS – pronounced “nabs”) was held in Louisville, KY. NAHBS is an annual event that is held in a different city each year where framebuilders and component, accessory and apparel manufacturers show off some of their latest creations and innovations. 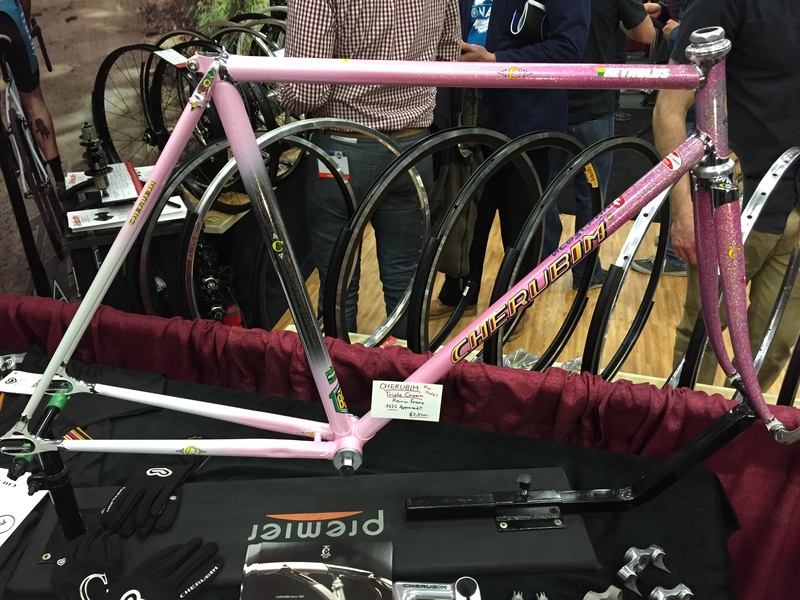 This year was the first time I was able to attend NAHBS, after first hearing about it several years ago, and I had a blast. 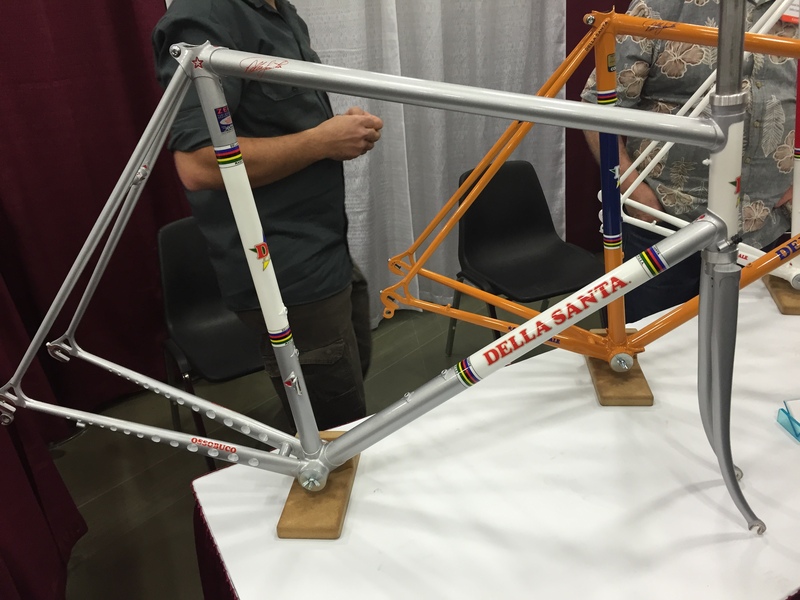 There were bikes made of all sorts of materials (steel, carbon, titanium, wood, bamboo) built for just about every purpose (road, mountain, cyclocross, track, randonneur, gravel grinder, kids’ push bike, cargo, tandem, fat bike, etc.) and they were all handmade with the unique style of each builder. Prototype components, one-of-a-kind bikes, highly detailed paint jobs and fancy lug work were just some of the things found at every booth. 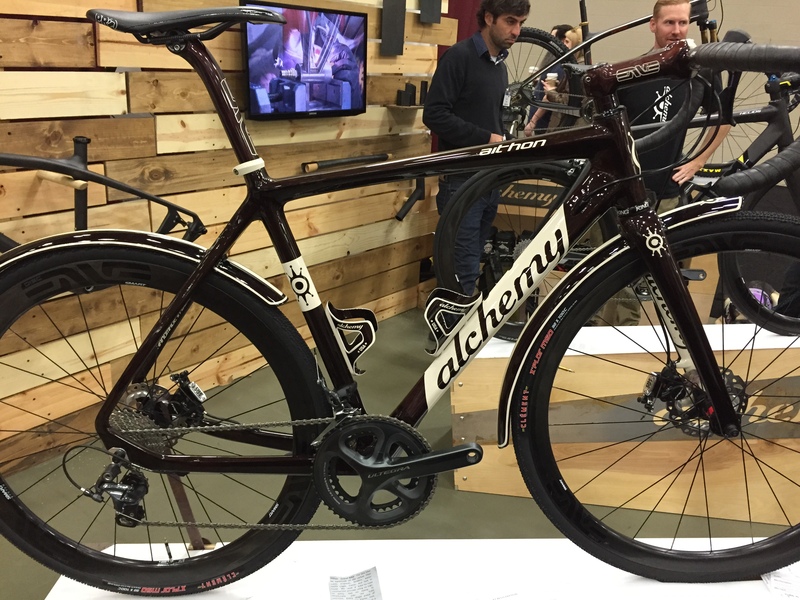 Full carbon gravel bike with integrated carbon fenders. Randonneur w/ S&S couplers so it can travel easily. It reminded me of my bike, albeit a little fancier, and I loved it. Beautiful lugged steel track bike with an incredible attention to detail, as usual for Cherubim. A tribute to the Louisville Slugger, made with wood from their factory and it had a saddle that was made from baseball glove leather. I love baseball and bikes so this was right up my alley. Lugged steel from a respected builder that has been in the game since the ’70s. Close-up of the chainstays to show the holes! 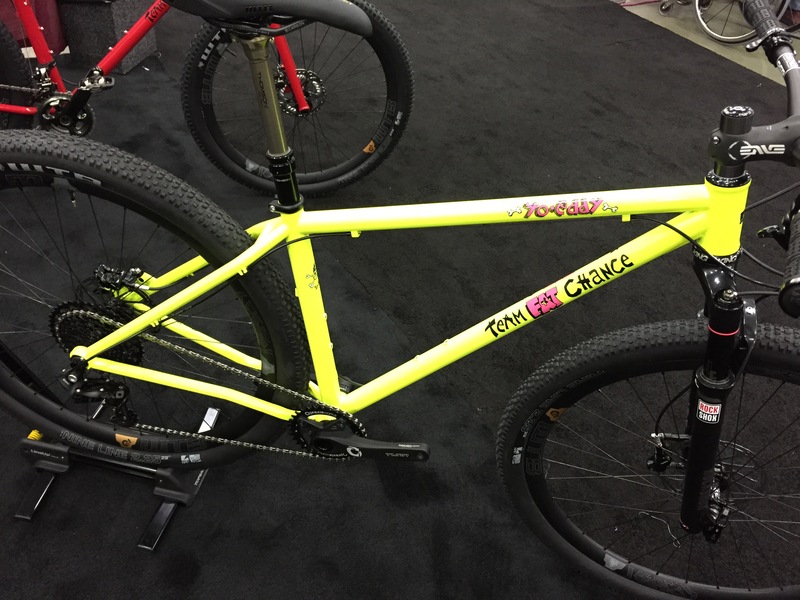 Back from the dead, Fat Chance’s updated Yo Eddy! featuring new carbon rims from WTB. 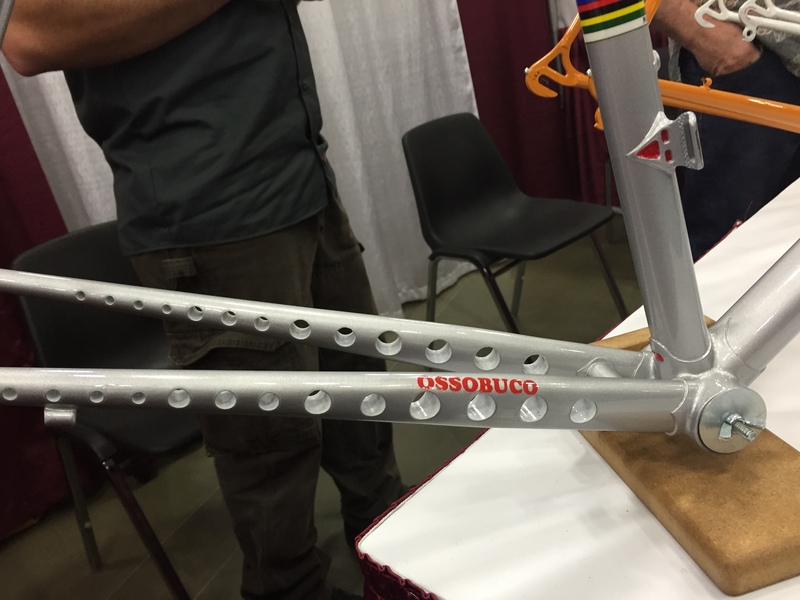 Odd-looking ti bike from a company that is not a bicycle building company. All bends are welded segments, not actual bends in the tubing. Very cool ti-carbon matrix tubes. 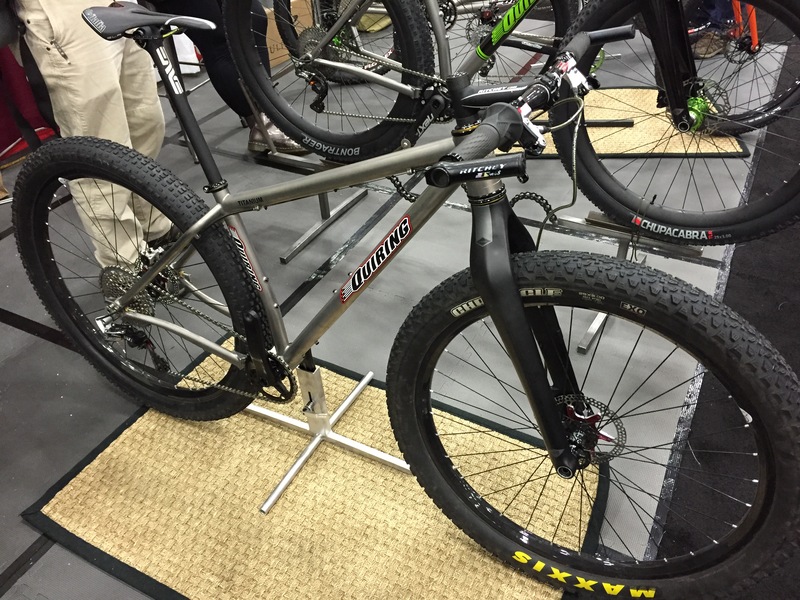 Titanium and carbon fat bike that they claimed weighs only 21 lbs! I didn’t have a scale, but it was definitely light. 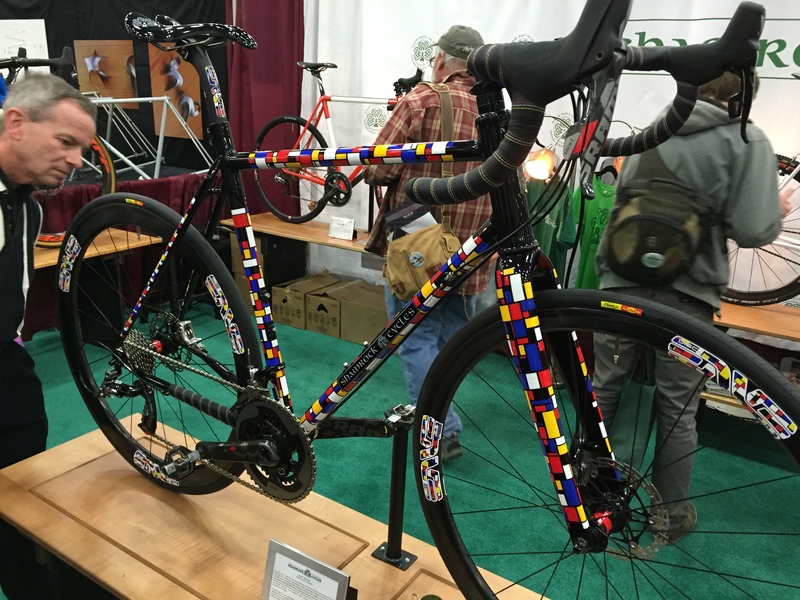 Fillet brazed road bike that required 80 hours of tape and mask time for their Mondrian theme. Yes, I am a sucker for steel. 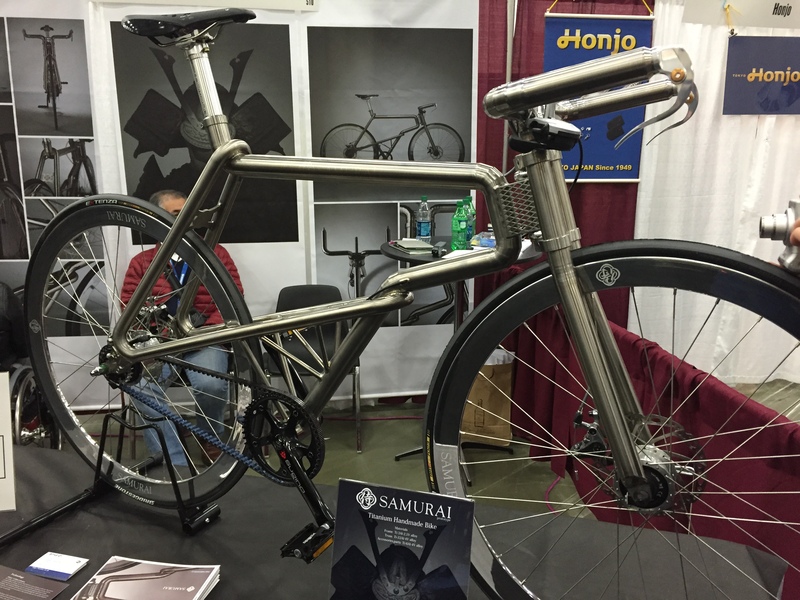 For more photos of bikes made with other materials and more about the prototypes seen at NAHBS 2015, check out the articles on Bike Rumor or google around a bit. 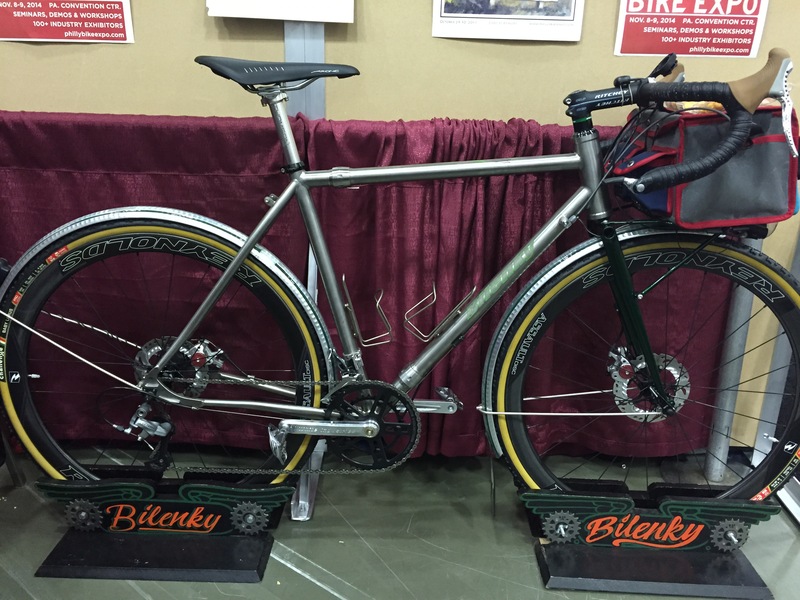 Here’s a list of the NAHBS 2015 Award Winners with photos. In October, one of the progenitors of what we now call mountain biking published a book about the history of our sport: Fat Tire Flyer: Repack and the Birth of Mountain Biking, by Charlie Kelly. In 264 hardbound glossy pages, Kelly tells how he and small group of friends including future icons like Gary Fisher, Tom Ritchey, and Joe Breeze, among others, started riding old fat tire Schwinn cruisers, which they lovingly called Klunkers, on the fire roads of Marin County near San Francisco in the early-mid 70s. “Repack” refers to the name of their favorite descent, which lost some 1300 vertical feet over less than 2 miles. By the time they reached the bottom, all of the grease had burnt up and smoked out of the coaster-brake rear hub which needed to be serviced (repacked with fresh grease). Over the course of a few years they started modifying those old bikes to suit their needs (adding derailleurs and gears and so on), then started making a few purpose built off-road bikes, and thus was born the mountain bike, which went from subcultural obscurity to the international multibillion-dollar passion of millions of recreational and lifestyle riders, as well as Olympic crosscountry and Red Bull Rampage insanity. 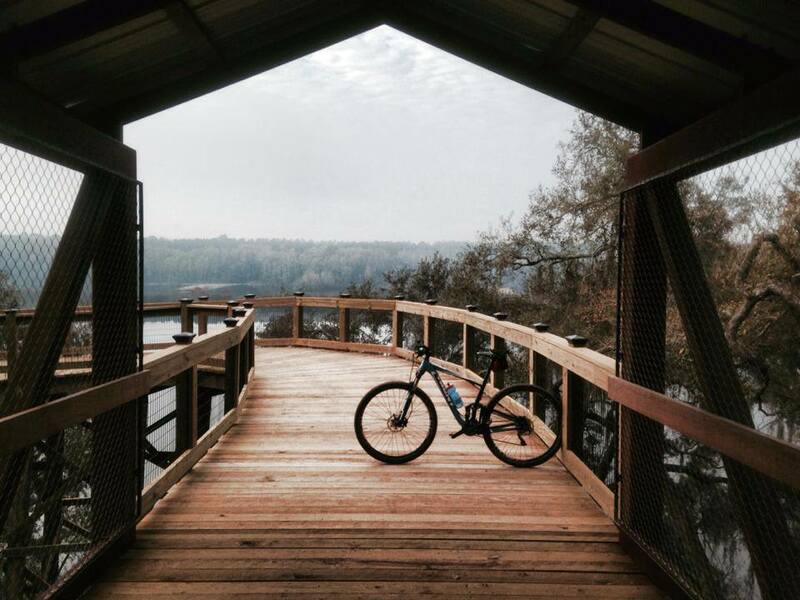 To say that mountain biking has become a big deal is like saying people like beer. Duh. Charlie is a decent writer and storyteller, so the prose flows pretty well. There are lots of pictures of early bikes and hippies flying down dirt roads in jeans and combat boots, unhelmeted hair flying. The Grateful Dead make an appearance, and there’s a lot of Gary Fisher stories (Charlie and Gary were roommates and eventual business partners). Anyone interested in mountain biking ought to enjoy reading the book, or at least flipping through and looking at the pictures. Less than $30 on Amazon (click the photo below and treat yo’self). The appendix contains some of the earliest stories and news pieces on mountain biking, which are interesting to read alongside this retrospective. 2014 Salsa El Mariachi 2, at the intersection of Twilight and the East Connector near Munson Hills. The El Mariachi is the 29er hardtail for slaying singletrack or getting your bikepacking trips on. Simple, comfortable and efficient, the frame features Alternator Dropouts that make the El Mariachi an even more versatile bike. Thru-axle, geared, singlespeed, fender mount or Rohloff dropout plates are all options should the spirit move you. The Alternator Dropouts also help you create a bailout gear for those SOL situations deep in the backcountry. Titanium and steel models are available. Both provide a fantastic ride quality that won’t beat you up as you pour on the miles. Super-short 430mm chainstays offer ridiculous control as you carve up the trail. 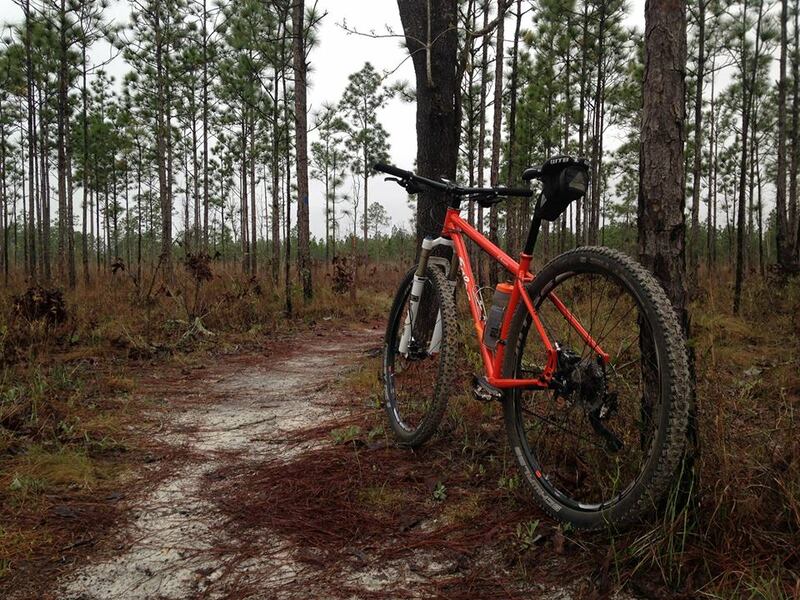 Run your El Mariachi with suspension, or set it up with our Firestarter Carbon fork to truly customize your ride. You can even throw our Alternator Standard Rack and panniers on for some off-road touring—or staying out later than originally planned. El Mariachi. The perfect singletrack soundtrack. OK, so mtb, versatile, customizable, good. But marketing, right? 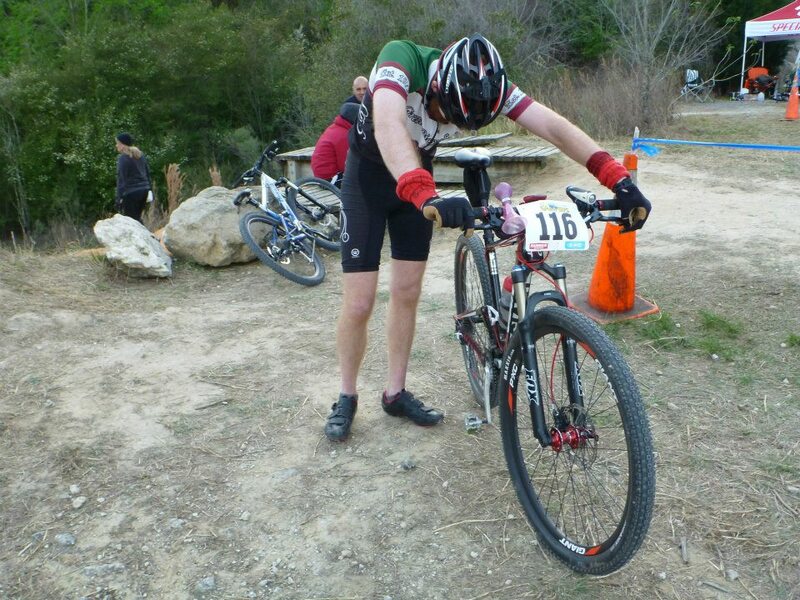 Chris, El Mariachi 3: Love mine; I’ve had other hard tails and currently a full suspension 29er as well. You couldn’t give me an aluminum hardtail; steel is the only way to go, IMO. The steel soaks up a ton of chatter, the faster you ride it- the smoother it feels. I put Stan’s Crests tubeless wheels on mine and it really came alive as a result. The lighter wheels are a huge advantage over the stock set. I have put over 2k miles on my El Mar for the year I’ve owned it and actually ride it more than my full suspension rig. Josh, El Mariachi 2 [full disclosure: GBS employee and writer of this post]: I love mine. I’m still working on getting the fit just right for me, but I’m getting close. I got it because the frame will last basically forever, I love the fact I can swap to singlespeed and back at will with the adjustable drop-out, they’re an awesome company that stands behind their product, steel is real, such a classic design (it oozes mountainbikeness). Works fantastic on Munson/Twilight kinda stuff, and much better than I had expected on more technical trail (since I’m used to a full suspension Giant Anthem 29er). When I want a more challenging ride I like to take it to Caddy/Mag as well as RB/Silk/Cambodia, where the roots force me to think about the best line. That said, it eats them up. I plan to keep and ride mine for a long long time. Note: I made only minor tweaks to comments to make them read better for this setting as opposed to an informal private fb chat. Shared with permission. 2015 models are out and our rental fleet is about a year old, which means it’s time to sell off the old to make room for the new. Giant Sedona DX extra large, $375SOLD! 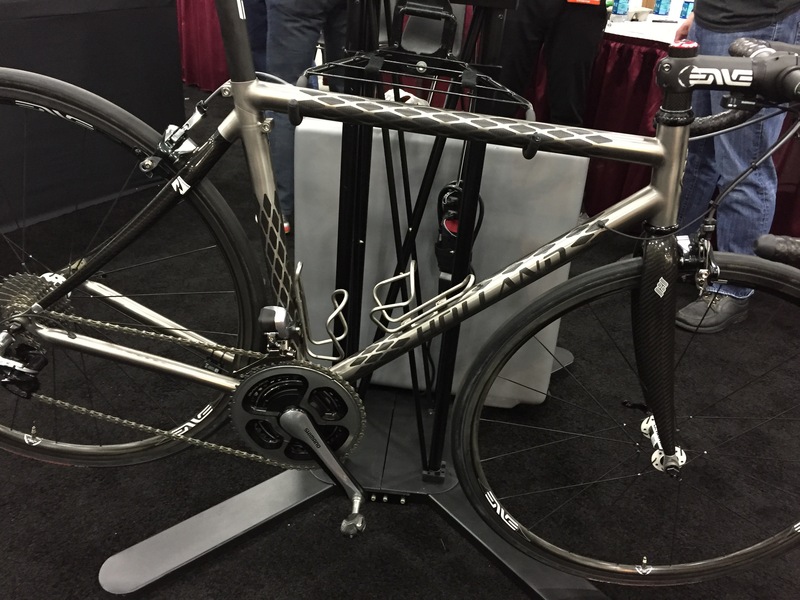 Giant Cyress DX extra large, $399SOLD! Giant Sedona W medium, $299SOLD! Giant Cypress W extra small, $299SOLD! Giant Cypress W small, $299SOLD! Giant Cypress W medium, $299SOLD! Giant Talon 29er 1 extra large, $699SOLD! Giant Defy 5 medium, $525SOLD! Giant Defy 5 medium/large, $525SOLD! Giant Avail 5 extra small, $525SOLD! Giant Avail 5 small, $525SOLD! If you’re not a cyclist, you look at a bike and see a toy, or a simple machine; an assemblage of parts, wheels frame handlebar saddle, that add up to something you did as a kid. But if you are a cyclist, you see something else. You can’t ride a fat bike without a smile on your face. You see a way to experience the world, get somewhere you need to be, spend time in the woods, get your thrills, health, more ice cream, competition, carry groceries, commune with friends and family, de-stress after a long day or week or month or year or decade, challenge yourself, overcome fears. You remember all the miles, trails, hills, smells, pain, joy, friends, weekend trips, adventures, and beers you consumed after. You see access to a better life, a machine that literally takes you places, sometimes places you can’t otherwise go. If you’re not a cyclist, look at your friends who ride, and envy them, because we get to ride our bikes. Or better yet, get up off the couch and find a bike and a friend, and let us show you the PURE UNBRIDLED HAPPINESS we enjoy regularly on two wheels. Team GBS at Santos after a fast lap. First thing: it’s not as heavy as you might expect. Without pedals, 34 lbs. I ran my trusty old entry level Shimano M520 pedals, so around 35 lbs as ridden. As yet there’s no suspension on these bikes (though I hear those conversations are happening), but you really don’t need it, at least not on the trails I rode (which are known for being untechnical). Still, there’s the occasional root or log across the trail, but you hardly notice them. I was probably running the tires a little over-pressurized at 20 psi (max recommended on the stock Surly Nate’s is 30 psi, but that strikes me as high unless you’re on pavement or really smooth dirt). In any case, depending on conditions, it would be fun to experiment with different pressures. I’m sure someone has done this and recorded the results online. The most amazing thing to me was how great the Mukluk felt in corners, sandy or otherwise. 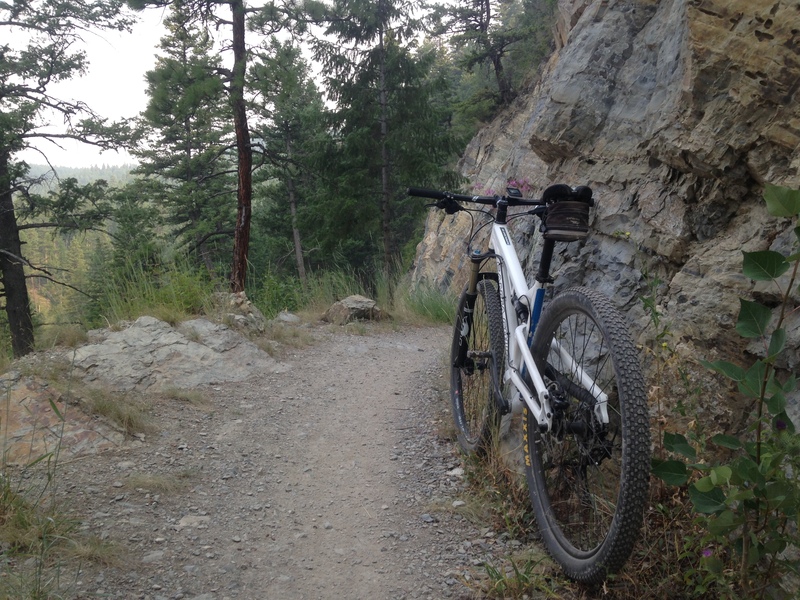 I expected it to feel clunky compared to my other bikes (a Salsa El Mariachi 29er and a Giant Anthem X 29er). I’m not particularly skilled when it comes to handling, but I felt extremely confident laying it over in turns. There’s just so much traction and contact patch on those big ol tires (26 x 4.0); it grabs the ground and hangs on. In a related note, the tires throw a ton of sand up as you can see from the picture above. The morning I rode was damp due to rain the day before (but those sandy trails drain very quickly). Speed; you’d expect with that much traction and rubber to lose efficiency and therefore lose speed. According to Garmin/Strava, I averaged 11.6 mph. 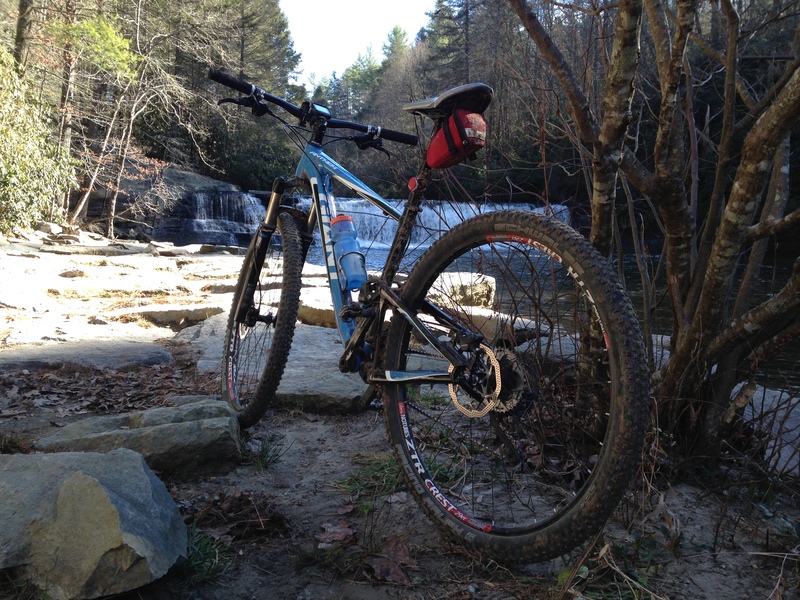 I checked a similar ride on the same trails from a month ago on my hardtail 29er: 11.6 mph. I was riding with small group of regular riders and was concerned about being able to keep up with them on standard 29ers, but had no problem at all. The most important thing is that I had a really good time. I’m looking forward to riding it some more. 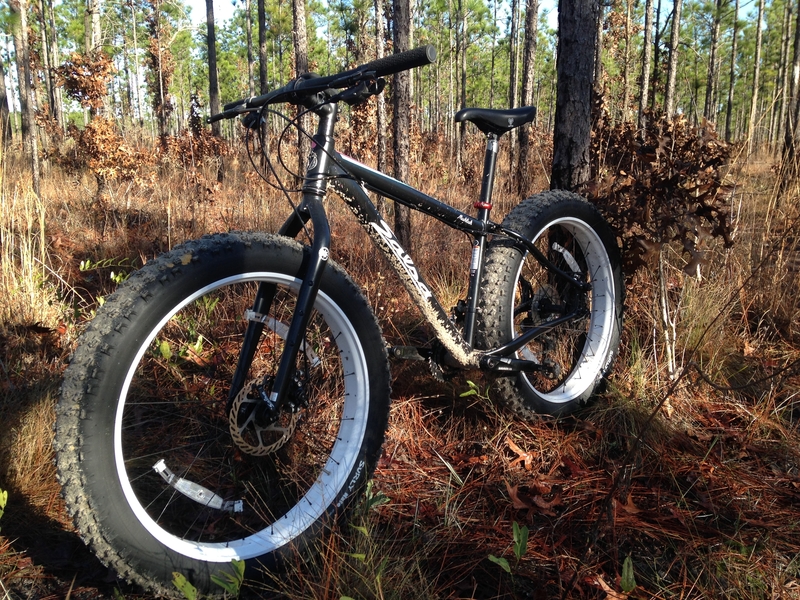 Fat bikes are known for their capabilities in snow, which we lack in the Florida panhandle, but they’re also great in sand, which we have in prodigious quantities. 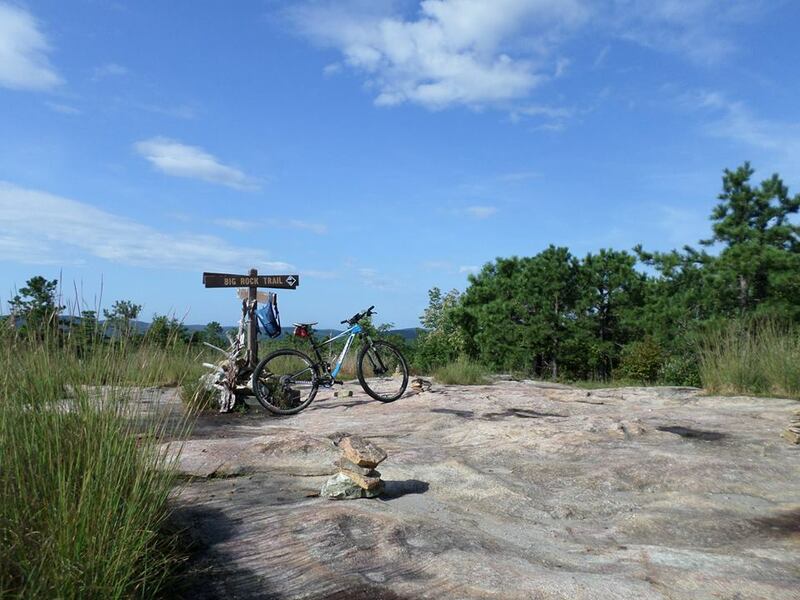 Bikepackers and dirt randonneurs who want to explore deep in the Apalachicola National Forest, or undeveloped barrier islands would find this bike ideal. It’s not for everyone, but I challenge you to ride one without a smile on your face. You can demo ours for $60 for a day (24 hours, give or take a few) if you want to see for yourself. We have a medium. 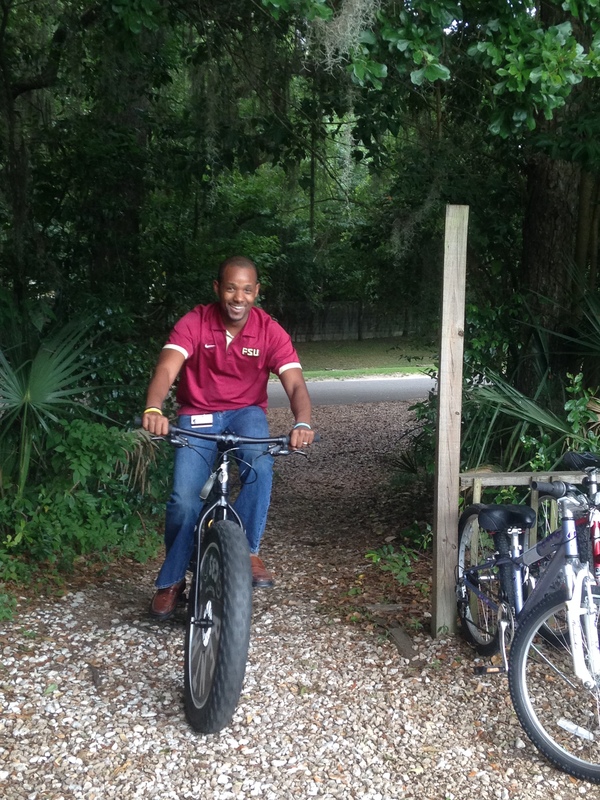 And of course you can test ride it around the shop for free anytime (call first; it floats between shops). 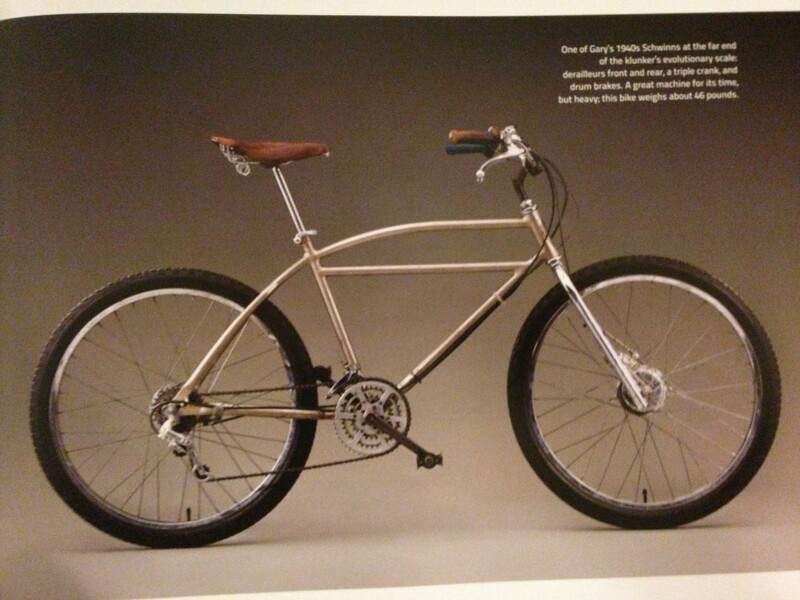 The bike retails for $1850.